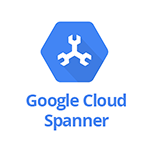 Use SignalFx to monitor Google Cloud Spanner via Google Cloud Platform. API Sent Bytes by Method - Rate at which uncompressed response bytes sent by Cloud Spanner grouped by method. API Received Bytes by Method - Rate at which uncompressed response bytes received by Cloud Spanner grouped by method. Instance CPU Utilization - CPU utilization of the instance. API Request Count by Method - Rate of Cloud Spanner API requests grouped by method. Storage Used - Storage used in bytes by the instance. Node Count - Total number nodes in the project. CPU Utilization - Utilization of provisioned CPU by all instances. Sent Bytes - Rate at which uncompressed response bytes are sent by Cloud Spanner. Received Bytes - Rate at which uncompressed response bytes are received by Cloud Spanner. 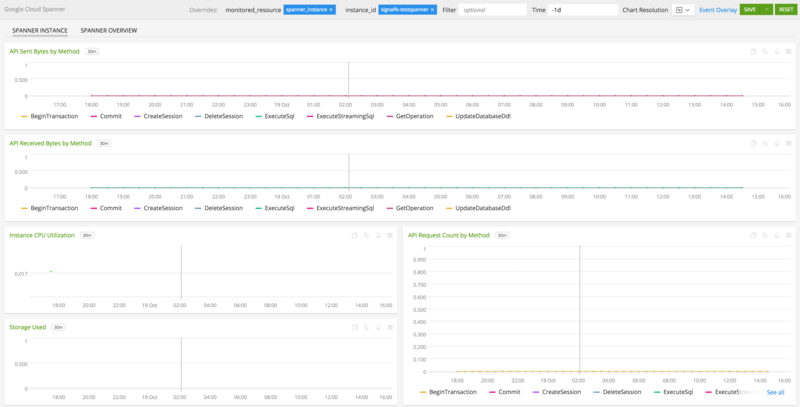 Request Count - Rate of Cloud Spanner API requests. Storage Used - Storage used in bytes by Cloud Spanner. Uncompressed request bytes received by Cloud Spanner. Rate of Cloud Spanner API requests. Uncompressed response bytes sent by Cloud Spanner. Utilization of provisioned CPU, between 0 and 1.